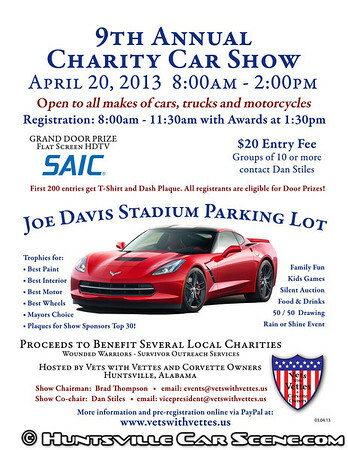 Registration is open to all makes and models of cars, trucks, and motorcycles and is $20. Registration ends at 11:30am and includes a T-Shirt and dash plaque to the first 200. Pre-registration available online here. All Pre-Registrations will receive an additional door/grand prize ticket. For groups of 10 or more, contact Dan. In addition to the awards, there will be door prizes and a 50/50 including a flat screen HDTV grand door prize. There will also be family fun, kids games, a silent auction, and food and drinks. Proceeds from the show to benefit local charities such as the Wounded Warriors, Survivor Outreach Services, and Toys for Tots. Samir...this one is at Joe Davis Stadium, not Bridge Street. Thank you so much for the correction! Listing updated. I'm not exactly sure how I missed that either. It's always been at Bridge Street so you weren't looking for it, I guess...thanks! Yeah, but I usually go over a flyer each year for any changes. Somehow I missed the big 'Joe Davis Stadium Parking Lot'. Showstopperz coverage of the show!